When Danny Herman started his company in 1964 – driving a Kenworth conventional he bought from his uncle that was as nearly as old as he was – he faced many challenges. But one of them wasn’t rapidly rising diesel fuel prices. Danny Herman Trucking’s wide-cab Kenworth T700s are equipped with 455-hp PACCAR MX engines and 75-inch AERODYNE® sleepers. The PACCAR MX engine provides 1,650 ft-lbs of torque powered through a 10-speed manual transmission. The fuel-efficient Kenworth T700 equipped with the low-emission PACCAR MX engine was recently named the 2011 Commercial Heavy Duty Truck of the Year by the American Truck Dealers. The company has 180 company-owned tractors, most of them Kenworths, and 90 owner-operators. The company and owner-operator trucks run from six terminals in Nogales, Ariz.; Fontana, Calif.; Lebanon, Mo. ; Mountain City, Tenn.; and El Paso and Laredo, Texas. It also has a drop yard in Nashville. Danny Herman Trucking handles its own routine maintenance from shops at a few of its terminals with parts and warranty support from Kenworth’s network of dealers. 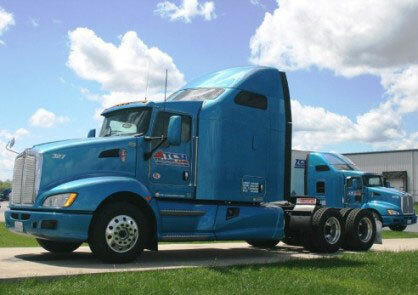 About 40 percent of the company’s drivers are team drivers running approximately 225,000 to 230,000 miles per year. The company’s solo drivers travel an average of 140,000 miles per year. The company hauls mostly unfinished products destined for manufacturing facilities, many of them in Mexico and in the Midwest. Earlier this year, the company earned certification as a Customs-Trade Partnership Against Terrorism (C-TPAT) partner from the U.S. Customs & Border Protection agency of the Department of Homeland Security. This certification reduces the amount of time shipments must be physically inspected by custom agents as they cross the border. That certification is critical to the company since much of its business comes from hauling time-sensitive materials from single sources in the United States and Mexico for delivery to facilities across the border. The company’s trucks pick up loaded trailers in the United States destined for transloading depots in Mexico where they are then picked up by Mexican carriers for delivery. On the return trip, Danny Herman trucks pick up loaded trailers that Mexican carriers have delivered to the company’s terminals in El Paso and Laredo, Texas, and take them to assembly plants in the United States. Danny Herman Trucking, which also hauls materials for the home building market and the automotive industry, prides itself on providing timely delivery services for just-in-time shippers, Joe added. It accomplishes this by maintaining an average length of haul of 1,450 to 1,500 miles. This allows team drivers to load and unload every other day and solo drivers every three days, for the most part. Consequently, drivers can use their hours of service more efficiently. 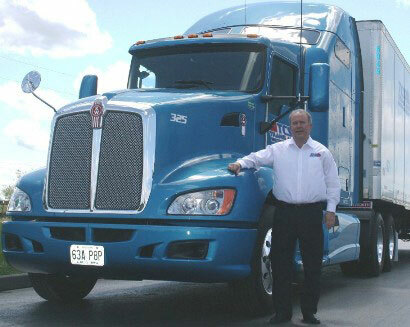 “It’s important for us to keep our drivers comfortable and productive, which is why the Kenworth T700 has become our aerodynamic truck of choice,” said Joe Herman. “The T700 offers our team drivers a comfortable work environment with a bigger interior and room for drivers to stand and stretch their legs between shifts.